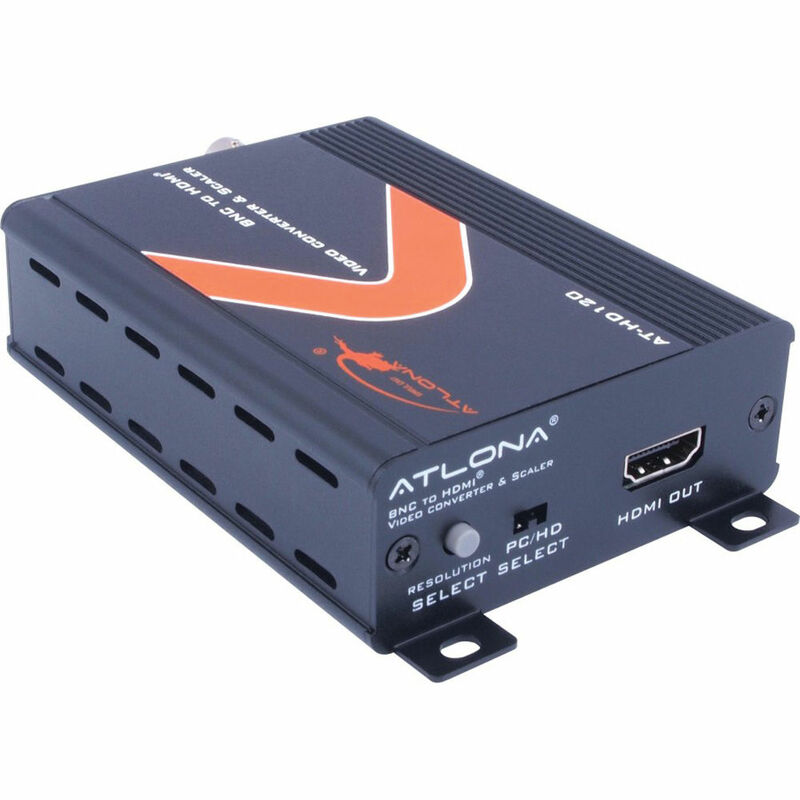 The Atlona Composite Video & Stereo Audio to HDMI Video Format Converter / Scaler is designed to convert and scale a composite video (BNC) signal from a DVD, VCR, or camcorder to an HD display. It accepts input signals up to 1080p and UXGA (1600 x 1200) and provides output that matches the native resolution of the connected display. Locking BNC connectors ensure a secure and reliable connection. Stereo audio signals are embedded into the video signal for transmission of output via a single HDMI cable. A Plug-n-Play setup ensures that the converter/scaler does not require additional software for operation. An on-screen display allows you make changes to the output resolution of signals. In addition, you can select the output for PC or HDTV display. Box Dimensions (LxWxH) 11.1 x 7.3 x 2.9"
Composite Video & Stereo Audio to HDMI Video Format Converter / Scaler is rated 4.7 out of 5 by 6. Rated 5 out of 5 by Josh from Simple composite to HDMI that works Needed a quick & easy way to connect my anolog video mixer to a clubs new in house digital display. This scaler/ converter is solidly constructed and best of all it's Plug n play. I broadcasted an MMA event with it for over 4hrs straight without any problems. Don't expect crystal clear 1080p out, remember that output video is only slightly better than input video and the input video is 480i. But it does work well and at about 1/10th the cost of the cheapest digital mixer I could find that didn't require additional supporting equipment to work. Rated 4 out of 5 by Allan from Does what it says, nice quality Only reason I'm not giving it perfections is that the digital format selection means that pairing it with a Blackmagic Television Studio HD is a bit of a pain since the format needs to be correct before any signal is received. Plugging it into a device that lets you select the correct signal and re-plugging into the Television Studio though does work. Rated 4 out of 5 by R. Harrison from Good Device, but. Good device and it works well, but it does not properly scale standard definition broadcasts. Rated 5 out of 5 by Ken from WORKS GREAT! exactly as advertised. Connect the unit and forget about it. Rated 5 out of 5 by David from Solid construction, nice video image For those looking for a high quality, road-ready composite to HDMI converter this unit is well-worth the money. No thin, plastic case here. It's black powder coated extruded aluminum and the connections are rock solid. I really like this as an upgrade from the cheaper, plastic constructed comp-HDMI converter I was using. As for picture quality, it is really good but when you get to within a foot of a 42 LCD screen you will notice it seems to add some sparklies on the borders of high contrasting areas that are moving - such as around the eyes, or a white shirt with a black tie. Of course, nobody watches a 42 screen at a foot away so when I move back to the appropriate viewing distance, the sparklies blend in and disappear from view. The image quality is nice. It seems to add a tweak of about 2% to 5% in saturation and contrast so the HDMI image is a little sharper and more defined than the original composite image at the input. Unfortunately, these adjustments are hard-wired and not user adjustable. These two things aren't a big negative so I kept my review at 5 stars. The multiple resolution options for the HDMI output are nice, and very easy to toggle through. If you accidentally choose a resolution your screen can't display (and thus cannot read the on-screen menu) simply toggle the select button a couple of times and wait for it to change to the next resolution on the list (voice of experience here!) The only thing I wish it would have is the ability to choose between 16:9 and 4:3 for the composite input. It only has 16:9 on the input so the older 4:3 VCRs and video cameras are going to have their pictures stretched to fit. I know that's what wide screen TVs do anyway, but the cheaper comp-HDMI convert I have (that I don't like the image on) does allow for that option. Overall, this will be a good, solid, road-ready unit for you and is well-worth the extra cost over the plastic models.